The political career of Mahatma Gandhi, one of the greatest "Man of Peace", the pioneer of Satyagraha (Devotion to Truth) and Ahimsa (Non-violence), had started in South Africa. In his own words - "Truly speaking, it was after I went to South Africa that I became what I am now." 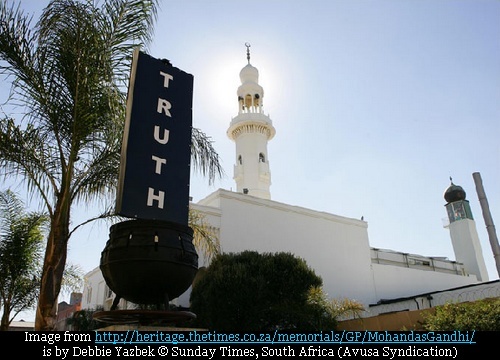 His earliest act of peaceful resistance to tyranny through mass civil disobedience and non violence, took place on August 16, 1908 outside the Hamidia Mosque, Jennings Street, Newtown, Johannesburg, where about 3,000 Muslims, Hindus and Christians protesters led by Mahatma Gandhi gathered to oppose the apartheid law of mandatory carrying of registration documents/passes by people classified as "non-white" by the South African government of Jan Smuts. A huge bonfire was lit in a cauldron (locally known as potjie) and in a defiance move, the non-whites burned their ID cards. "This plan was adopted, leading to a seven-year struggle in which thousands of Indians were jailed (including Gandhi), flogged, or even shot, for striking, refusing to register, burning their registration cards, or engaging in other forms of non-violent resistance. While the government was successful in repressing the Indian protesters, the public outcry stemming from the harsh methods employed by the South African government in the face of peaceful Indian protesters finally forced South African General Jan Christiaan Smuts to negotiate a compromise with Gandhi. Gandhi's ideas took shape and the concept of satyagraha matured during this struggle." Thus this was the beginning of Mahatma Gandhi's Satyagraha or passive resistance campaign, which he applied to powerful effect against the white rulers in South Africa, and later against the colonial masters in India - which ultimately led to India's Independence. In order commemorate this event, a memorial, as depicted below, was erected in April 2006, at the very spot where the cards were first burnt. 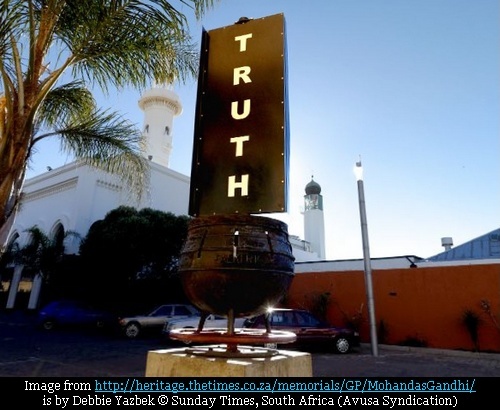 The memorial known as the "Burning Truth" was designed by Usha Seejarim and features a potjie, like the cauldron in which Gandhi and his fellow supporters burned their passes. When the wheel beneath the cauldron is rotated, a zoetrope, which is part of the memorial enables viewers to see an image of a pass actually burning. Avusa Syndication for granting permission to reproduce these pictures from http://heritage.thetimes.co.za/. Dagrmi who helped me identify the exact location, which was later confirmed by Avusa Syndication.